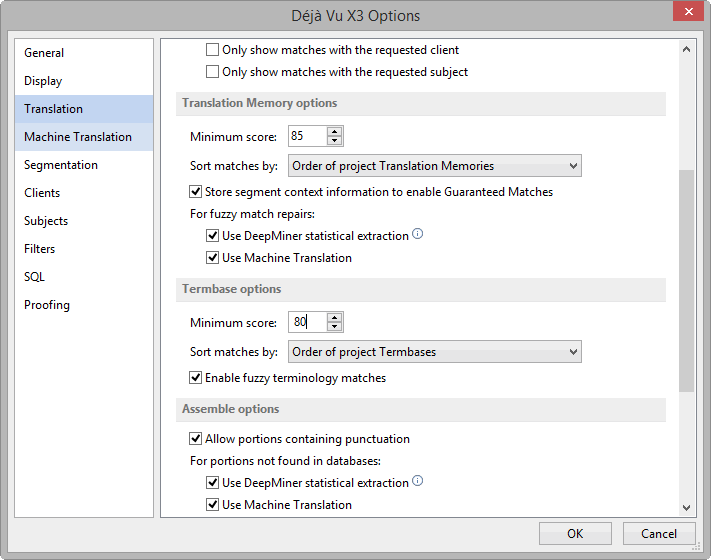 In the Déjà Vu X3 Options dialog, select the Translation tab. Here you can change the Minimum Score (i.e., degree of fuzziness as a percentage) the matches are supposed to use. The setting under Minimum Score will depend on your personal preference and the quality and extent of your databases. While the default setting is 75%, many users with large translation memories prefer a higher setting, while others try to benefit as much as possible from whatever they have in their translation memories. Make the desired settings and click OK.